This winter, retreat to Turpin Meadow Ranch, the best choice in Wyoming Nordic ski resorts, with access to 15 km of groomed Nordic ski track, a dedicated fat bike single track, among other exciting activities. From back-country skiing to snow mobiling, there are so many Jackson Hole winter activities to enjoy at the ranch while staying in our warm luxury cabins. Our experienced winter guides can help enhance your stay and share the best spots to check out both on and off the ranch. 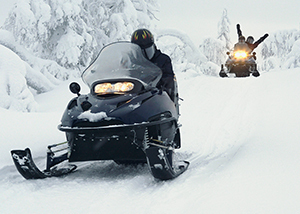 Explore some of our favorite winter activities below. Trail passes are also available to daytime visitors. 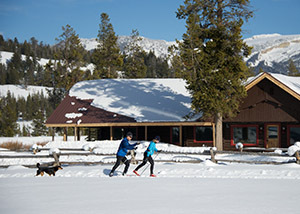 Our Nordic trails are the featured Winter attraction at Turpin Meadow Ranch. Designed by Olympic Nordic Skiing and Biathlon athletes, the track stretches over 15km and several different trails. Groomed daily, tracks are set for both classic as well as skate skiing and start right at your cabin door. 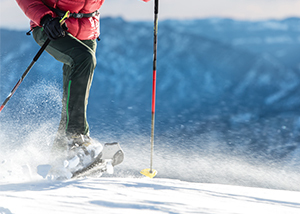 Surrounded by the mountains, Turpin Meadow Ranch is at the center of the action for the ultimate backcountry skiing experience in Jackson Hole and the surrounding area. View our recommendations for local guides and safety information. After a day out in the powder, retreat to your luxurious cabin and enjoy our cozy, historic lodge. Turpin Meadow Ranch proudly sits on a spur of the famous Continental Divide Trail, with more than 500 miles of groomed adventure. Our exclusive guides are some of the most experienced around. 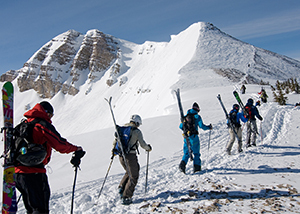 Their extensive knowledge of the trails and backcountry provides an adventurous and safe day in the snow. 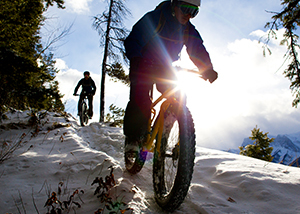 Enjoy the thrill of the riding over snowy trails this winter on board a fat bike. Join us at Turpin Meadow Ranch for a ride on our dedicated fat bike single track. With 15km of trails to explore, you're sure to have a blast. Our fat biking trails are groomed daily and start right out your front door. The nordic trails at Turpin Meadow Ranch offers 15 km of groomed trails with views of the Grand Tetons that the Washington Post called "one of the best in the entire valley". Our trails are open to snowshoers of all difficulty levels. With tracks set to your front door, Turpin Meadow Ranch is an ideal spot to try snowshoeing for the first time or test your abilities on more difficult trails.